Recipes and tips for following the vegan regime. Great for vegetarians just starting to dable into vegan cooking. The recipes are simple and tastey. I especially love all the different replacements for non-vegan items (i.e. eggs) and the dry herb to fresh herb measurement converter. We sell pancakes made from their recipe every day at my restaurant. Totally great, fun, imaginative. Absolutely a must for vegans, in my opinion. Their free thinking ways inspire me to think way outside of the box when it comes to vegan cookery. They make vegan food not only not punitive but in many ways preferable. Great first vegan cookbook. Lots of recipes for "omni" substitutes--sloppy joes, mac n' cheese...everything is excellent and very easy to make. 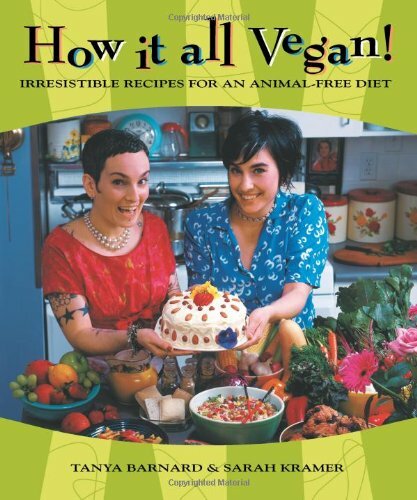 This is a great cookbook eve if you aren't vegan!